What is the requirement to make bread and wine for Divine Liturgy? Does the Orthodox Church have the same standards are the Roman Catholics? Aside from the obvious difference of leaven. That's how was I taught. So like the Catholics, no nitrates or preservatives in the wine? AFAIR you can use white wine (and dry or semi-dry too). It would be an act of extreme economia to allow this, to put it mildly. The problem is that most wines (apart from the sweetest) become very acid once the hot water is added. I meant the Catholics (like choy). Right. I was at a parish once, and we had to change wines because we found out the one we were using was artificially sweetened with corn syrup. Would the use of kosher wines like Manischewitz (sp?) be permitted? The wine I mentioned above was a Jewish kosher wine. It was fine, except for being artificially sweetened. We use Jewish wine too. Forgive me that I have forgotten that the Latins do use white wine. Although sadly such practice has spread to Eastern Catholic Churches. It was probably just fortified. Is that kosher? Cause that is what Mani is. Fortified means distilled grape spirits have been added to boost the alcohol content. Manischewitz does add corn syrup which makes it non-kosher for some Orthodox Jewish groups as well as unsuitable for both Orthodox and Catholics. And a slippery slope to Stalin icons. I thought that white wine was not allowed by Catholic tradition. I thought it was Anglicans and Lutherans who instituted this to support their odd notions. It is. De Defectibus only mentions what is in the wine, but not which color of wine. So white wine that fits the "requirements" will pass and in fact is more commonly used today because it just doesn't stain as bad as red wine. Yes. My priest uses that brand of wine. How old is that document, and what was the prevailing tradition before it? Not that that really matters for Roman Catholicism, sadly. It was a Papal Bull by Pope Pius V that came out of the Council of Trent. It described the defects of the matter when bread or wine could not become or be used for the Sacrament. There is no mention on color of wine. I've heard of bishops in prison in Soviet times using water. I wouldn't have given any credit to it except that it was my parish priest who told me about it during a catechism class. Are there any absolute requirements of matter that no economia can dispense? That would depend on what is classified as economia. When the definition is too broad, it falls apart and doesn't do it's purpose but instead counteracts its purpose. Better start writing the Bishops. Maybe they pray for the water to turn into wine? But in any case I have faith that God will supply the grace to them no matter what. Depends on the circumstances. In a Soviet prison camp, perhaps. In a land where there are supermarket aisles full of $5 bottles of wine, no. One would think stains would be the least concern when dealing with the Lord's blood... Wouldn't anything that gets spilled on be burned anyway? The stains can happen prior to consecration. Remember in the Latin Mass, normally only the priest receives from the chalice. The danger of spilling from consecration to the end of the Mass is minimal. Most of the spilling would occur when the priest is preparing the chalice and putting the wine in. At least that is what I heard from some people, that they prefer white wine because it is easier to wash the purificators. This is wear communing under one species gets us--using white wine because of the fuss of stains. Should we not use the purest and best we have? The Russians give communicants unconsecrated wine+water mix to drink after communion, and people manage not to spill it. I don't know...it's just fuzzy logic IMO. I don't think that much white is used to be honest. I know I've never come across it since I was ordained and I don't remember it being used as an altar boy. Its used here where I am at. As for spilling it, that really doesn't happen that much. Our chalices usually have a wide base to them so they aren't easy to knock over. If you talk about spilling off the spoon, that is what the red cloth is for, the red isn't just for prettyness, it helps hide stains. Usually the Priests clean up as best as they can. The clothes are reused and sometimes washed (they don't have the body on them). You try to clean up the best you can but sometimes you can't get everything. I've never ever seen white wine used and I seriously doubt it would fly. Nama is a style of wine - like Port or Riesling. Nama is created in the same manner as Commandaria, with a drying of the grapes to increase sugar content before pressing. Alcohol in wine is produced by conversion of sugar. A higher sugar content means more alcohol, unless the process is stopped at a certain point, that allows for sweetness. This natural fortification and sweetness is why Nama and Commandaria are used for communion. Port has natural sweetness but the fortification is gained by turning some of the wine into brandy and then adding back into the wine. The high alcohol content is needed so the wine will not go bad quickly, alcohol acts as a preservative. Once last note, Nama tends to be the preference because of the ruby color and pure grape taste. There is something special about the Santorini, volcanic soil that makes the Nama from there shine in taste and color. I remember hearing a story (how true this is I don't know) that on Stalin's birthday, the prisoners would be given raisin buns, from which the priest would remove the raisins and put that in warm water to make wine and use the bun for the Lamb. I knew a Maronite Catholic priest that used White Zinfandel for his chalice wine. When I was a Latin Rite Franciscan, we would mostly use a dry wine and sometimes it was white. I was told by my upper classmates that one priest even, once, used champagne! do eastern orthodox put salt in the bread? we have a strict 'no salt' rule, so the antidoran always seems to taste sweet (to me anyway). as for wine, it is the same (except i can't imagine we would ever use white!) and i have communed with commandaria. many british catholics (and some irish) commune with the Body and Blood both (as it should be). it seems to be that the Body only communing comes from central or eastern europe. in the serbian church we put salt. lots of it in fact. I've read somewhere that in Alaska grape juice is used in some places because of the alcoholism there. Again, from my Catholic experience. A Catholic priest said that as soon as air hits grape juice it begins to ferment. So, according to him, it could be considered "immature" wine. Go figure. i will make a note to not looked shocked if i take serbian Holy Communion. do all the EO use salt? i had greek antidoran once and it did taste different, maybe this is why. for us salt represents the sin, i can't remember exactly why. i suppose Christians in countries / areas where alcohol is banned also use alcohol free wine. Wait, you're saying that the water wasn't turned to Welch's at Cana? Didn't Jesus call us to be the salt of the earth? Also Leviticus said that grain offerings should be salted. The Catholic Church allows Mustum to be used. That is freshly squeezed grape juice that can ferment into wine but has not been given the time to do so. It is already in the fermenting process, but not enough that it is alcoholic. Or maybe it is a little alcoholic. Supermarket grape juice are either artifically flavored, or has been treated in a way that it won't ferment at all. To make the true Living Bread of the Eucharist you first need to make the small Barley Loaves. Without these it is not possible to make the authentic Bread of the Last Supper. The Barley loaves are the yeast which is added to three measures of flour ('there was a lot of grass in that place') and given to a 'woman' until all the dough has risen. Store-bought yeast is absolutely not used. Many are being deceived into thinking they are getting the real thing - a tragedy for desperate Christians and Christianity. The Evil ones have done a magnificent job in dividing and confusing Christians so the sacraments are being denied to the Faithful. This is partly why there are so few genuine miracles and Christians lack power today. Even now, Powers and Principalities unseen, are taking steps to make it forbidden to obtain the Eucharist. I really wonder how many 'Orthodox' Churches (especially in the West) actually are being operated by 'blind' clergy. It is the 'blind leading the blind'. It's tragic when laity (and clergy) are making Prosphora in an 'unorthodox' way. In a painting called Hermit Saints Triptych by Hieronymus Bosch you can see the five Barley cakes needed (see inset picture detail attached). To whom does a Christian go when they can't get real the real Eucharist? As for the wine, firstly there is Christian wine which is meant for frequent use as a tonic in small amounts ('for your frequent illnesses'). Then there is the Blood of Christ, which is not the same thing, and taken only at certain frequencies. Alcohol is to be avoided at all costs. The Bitter Cup is again, a separate thing. I would love to say all I know but am forbidden by hands stronger than mine. I will be severely castigated just for expounding this knowledge, even though I have never taken any oath. Good. It would be a catastrophe if you insisted on sharing all the secred "knowledge" you have with us. What is a repentant Philokalist? If a Philokalist is one who reads the Philokalia, why are you even reading this if you're not yet Orthodox? So...I wonder if our interlocutor knows what "artos" is? Fear not Michal, this 'interlocutor' will no longer share his wild, speculative theories amongst these digital mediums. Peter, by 'Philokalist' I meant one who loves goodness. Maybe I will never become 'Orthodox' - would I be welcome among 'Orthodox' with my questioning theories or do I have to behave like a silent sheep to be accepted? Αριστοκλής, I know of 'Artos', but I'm not sure how you might make it. When you have the audacity to tell the Orthodox that most of them are doing it wrong, even though you've never been Orthodox before, then one has to wonder if your biggest problem is merely your resistance to behaving like a silent sheep. Peter, Yes you are quite right. Please forgive my arrogance born of frustration and pride. I humbly offer my apologies. A little knowledge has filled me with the demon of pride. I realise I have much to learn! Holy Communion is so important in the world, that aside from Salvation and Eternal Life, the surplus ingredients even helped birth great beer the world! In the European and subsequent American experience, good beer is a result of these requirements for Holy Communion. The laity were required to tithe grain and wine/grape offerings for the use in the Mass. 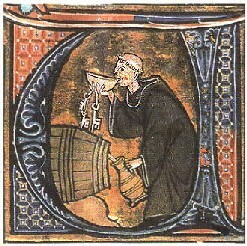 In Northern Europe, obviously grain is a bit more accessible than wine/grapes, so often if the priests had a surplus from offerings, it was not going to be wine. So what did they drink? Beer! Plenty of grain for that, and after experimenting with different recipes and brewing techniques delicious malty ales, hearty stouts, and crisp lagers were discovered. In Mediterranean and Middle East regions, grapes were a bit more prevalent, hence a more wine oriented culture, whereas in Europe and later America, beer took the lead as the cultural drink. What would we be drinking if those monks hadn't collected grains for the Offering? I was just going to ask this question- so wine just needs to be sweet, red, alcoholic, and pure? I can't bake bread worth a darn, but my husband and I are homebrewers and have made some good wine. We would like to try to make wine for the church since the bread is beyond my skills. Baking bread is easy. I went from totally not knowing how to make bread to making Prosphoras in under a year. Yes, I only started making bread in the Spring of 2011. You do have to invest a lot of time though at the beginning. You need, by experience, be able to develop your own technique and feel for the dough. When the Patriarch of the UGCC was in town, I had to make prosphora for the Liturgies that was going to happen. I haven't made prosphora in months (I made a huge batch in December last year for catechesis and we have a lot left over) but since I have learned the technique at least for this recipe, I just whipped together the dough almost unconciously. Just keep making bread all the time and you will develop the skills for it through trial and error. And bread is bread, you can eat all bread you make no matter how bad you do it, with the exception of undercooking in. But then you can always put it back into the oven and cook it some more. I think that this is perhaps a little unfair to the Anglicans who use white wine. In my Anglican days, I belonged almost exclusively to Anglo-Catholic parishes, where the use of white wine is fairly ubiquitous. In many cases, this is a conscious choice so that the people may come to know and understand that the wine becomes the Blood of Christ, regardless of its physical appearance as wine. This is in direct and deliberate opposition to the more protestant-minded Anglicans who often insist on using red wine to make their point that it is only a symbol of the Blood of Christ, and that it is, therefore, helpful for it to be red. While I agree that the Orthodox understanding that the Mysteries are both a sign and a symbol (that is, they signify the reality that they also become) is the fuller understanding and is to be preferred, I do not think that the notions of Anglicans who use white wine are odd. In fact, given their circumstances (being part of a church which contains people who deny the Eucharist), I think that they are to be commended. Of course, it would be better for them to simply join themselves to the Orthodox Church and be in communion with people who confess as they do, and where their belief in the Eucharist would be found to be a sacramental reality.